The Global Volcanism Program has no activity reports for Iliinsky. The Global Volcanism Program has no Weekly Reports available for Iliinsky. The Global Volcanism Program has no Bulletin Reports available for Iliinsky. 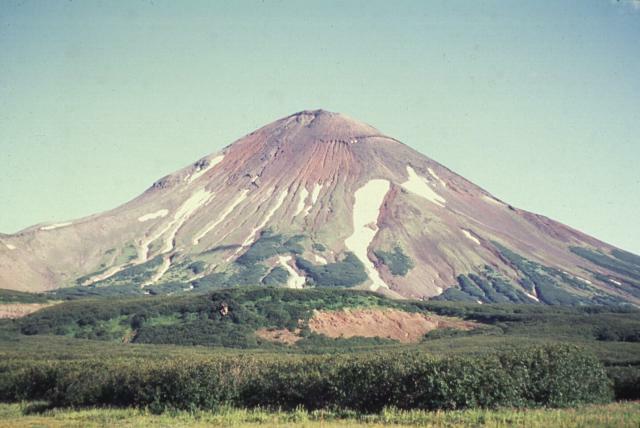 The conical Iliinsky volcano (also spelled Ilyinsky), rising dramatically to 1555 m above the NE shore of Kurile Lake, was constructed beginning about 7600 radiocarbon years ago at the NE margin of Kurile Lake caldera. The modern edifice grew within a 4-km-wide caldera produced by collapse of an earlier volcano creating large debris avalanches at about the time of formation of the adjacent Kurile Lake caldera. A period of strong silicic explosive volcanism during the mid-Holocene lasted about 800 years. A series of youthful lava flows cover much of the northern flanks. Growth of the modern cone was completed about 1900 years ago, after which a long quiescent period began. The only recorded historical eruption, in 1901, produced a large 1-km-wide crater on the NE flank. There is no Deformation History data available for Iliinsky. There is no Emissions History data available for Iliinsky. 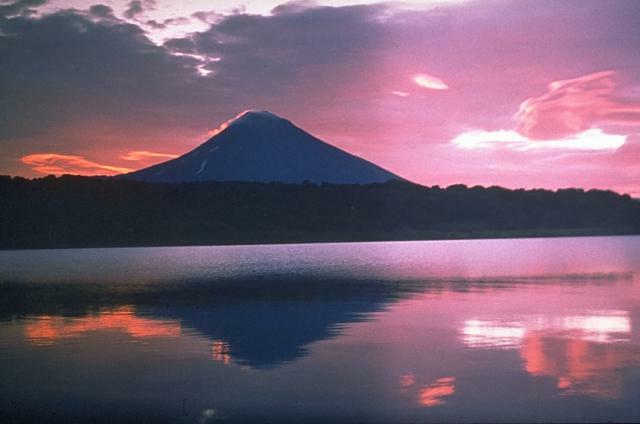 The conical Ilyinsky volcano, rising dramatically at sunrise above the NE shore of Kurile Lake, was constructed beginning about 8000 years ago within a 4-km-wide caldera of about the same age as the Kurile Lake caldera. 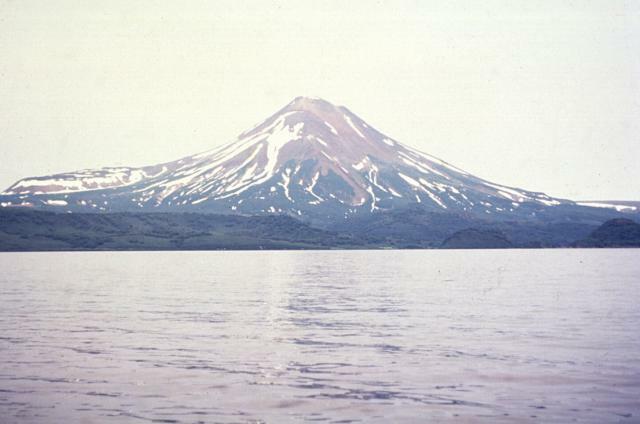 The 1578-m-high stratovolcano is one of several visible from the shores of one of Kamchatka's most scenic lakes. Its latest eruption, in 1901, created a 1-km-wide crater on the NE flank. The 10-km-wide Kurile Lake caldera was the source of one of Kamchatka's largest Holocene explosive eruptions about 8000 years ago. The maar crater in the foreground was created during an eruption in 1901 on the NE flank of Ilyinsky volcano. 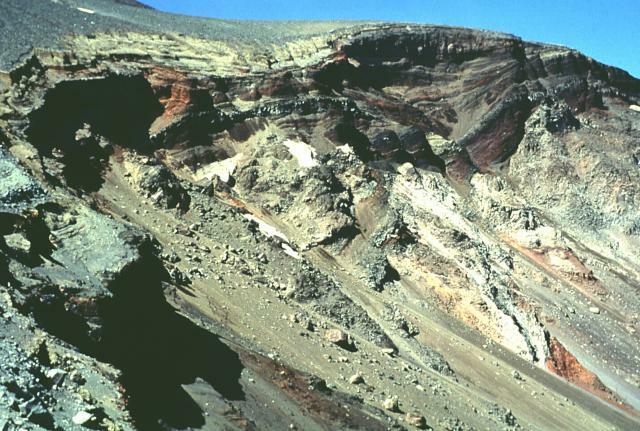 Light-colored tephra deposits from the maar-forming eruption cap the rim of the crater and blanket the flanks of the volcano. At the end of the eruption, lava was extruded on the floor of the 200-m deep, 1-km-wide crater. Snow-streaked Zheltovsky, another historically active stratovolcano, rises to the NE. Photo by Philip Kyle, New Mexico Institute of Mining and Technology, 1996 (courtesy of Vera Ponomareva, IVGG, Petropavlovsk). A prominent 1-km-wide maar was formed in 1901 on the NE flank of Ilyinsky volcano. The northern wall of the crater exposes areas of light-colored hydrothermally altered rocks (bottom) that are surrounded by talus deposits. The dark-colored bedded layers above this are pyroclastic-fall deposits of ash and scoria from earlier eruptions of Ilyinsky. The light-colored layers (upper left) on the rim of the crater are pyroclastic-fall and pyroclastic-surge deposits from the 1907 eruption. The bedded layers at the upper half of the photo are pyroclastic-fall and pyroclastic-surge deposits produced by successive explosive eruptions accompanying formation of a maar on the NE flank of Ilyinsky volcano in 1901. This eruption, the only one in historical time from Ilyinsky, created a new 800 x 1000 m wide crater, 200-m deep, that is breached by a gorge on the NE side. Zheltovsky stratovolcano rises across a broad valley NE of Ilyinsky volcano. The flat shelf on the right flank of Zheltovsky is the eastern rim of a 4 x 5 km, largely buried Pleistocene caldera. The dark mass seen halfway down the left horizon is a lava dome constructed over the western rim of the caldera. 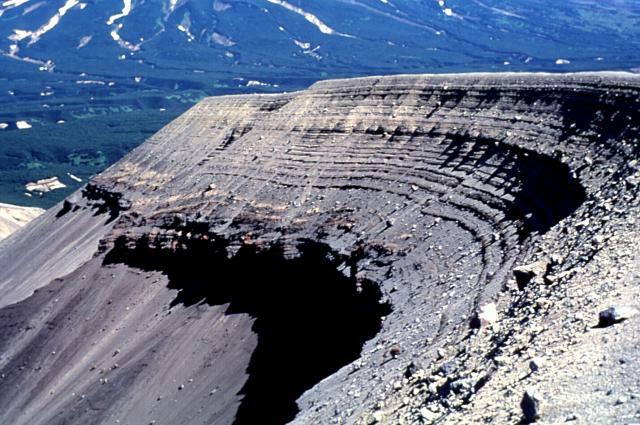 The western rim of a smaller, late-Holocene caldera forms the break in slope on the left side just below the summit lava-dome complex. The crater in the foreground is a NE-flank maar of Ilyinsky that formed in 1901. 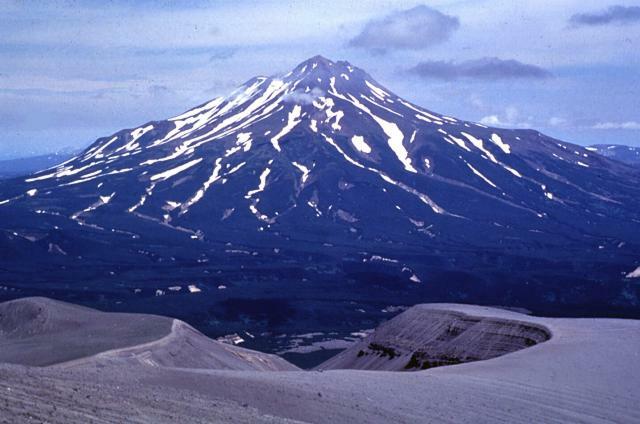 The conical Ilyinsky volcano, seen here from the NW, was constructed beginning about 8000 years ago within a 4-km-wide caldera of about the same age as the adjacent Kurile Lake caldera. A period of strong silicic explosive volcanism during the mid-Holocene lasted 1000-1500 years. Growth of the modern cone was completed during the late Holocene. A series of youthful lava flows cover much of the northern flanks. 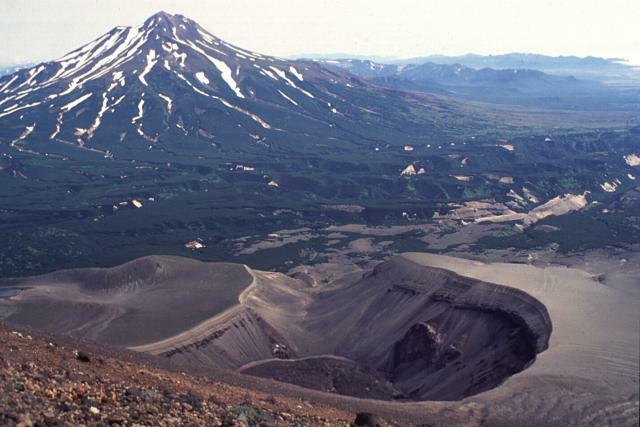 The only recorded historical eruption, in 1901, produced a 1-km-wide crater on the NE flank. 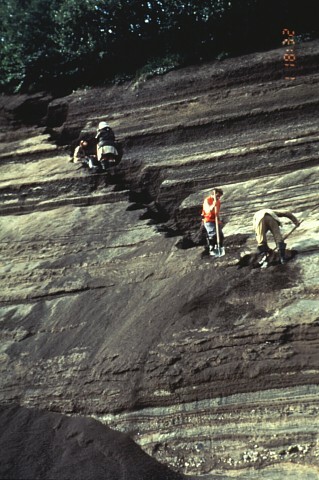 Photo by Oleg Dirksen, 1996 (courtesy of Vera Ponomareva, Institute of Volcanic Geology and Geochemistry, Petropavlovsk). llyinsky volcano, seen here across Kurile Lake from the SW at the outlet of the Ozernaya River, is a conical 1578-m-high stratovolcano constructed during the past 8000 years above the NE rim of Kurile Lake caldera. The flat ridge with a steep terminous on the left horizon is the profile of north-flank lava flows that were erupted from Ilyinsky about 1500-2000 years ago. There are no samples for Iliinsky in the Smithsonian's NMNH Department of Mineral Sciences Rock and Ore collection. Large Eruptions of Iliinsky Information about large Quaternary eruptions (VEI >= 4) is cataloged in the Large Magnitude Explosive Volcanic Eruptions (LaMEVE) database of the Volcano Global Risk Identification and Analysis Project (VOGRIPA).